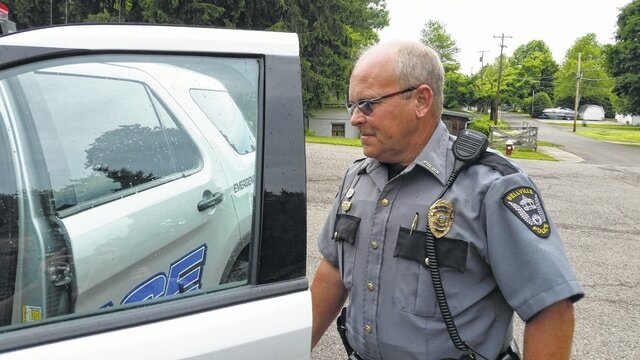 Bellville Police Chief Ron L. Willey is shown getting into his cruiser. Ohio is exploring the possibility of increasing advanced training requirements for all police departments in the upcoming year. The proposed increase is a result of Gov. John Kasich and Attorney General Mike DeWine’s task force known as the Ohio Collaborative Community Police Advisory Board. It was designed to fully analyze police procedures in response to the notable fatal shooting cases throughout Ohio. Several incidents among Cleveland Police including the Michael Brelo and Tamir Rice cases have drawn national media attention, raising the issues of trust between police officers and the communities they serve. As a result, Kasich is looking for the state to step in to set common requirements with all Ohio departments. These include increasing the time police members spent learning about safety issues – namely excessive force tactics and community-police relations. Currently, officers are required to train four hours annually at one of the state’s academies but the task force’s original proposal calls for individuals to spend 40 hours per year in training. Along with changing training requirements, the board may also tweak officer hiring procedures. The incidents that have gained the attention of the governor and national audiences alike may seem far off from Bellville. Seemingly, equally as far off are their consequences. However, staffing an adequate police force that operates within the budget is an annual concern to officials in the community. The reality of finances leaves the village with a limited payroll that does not allow it to pay officers particularly high wages. In addition to its four full-time officers, the Bellville Police Department is comprised of 12 part-time/auxiliary officers. The state’s mandatory training increase is especially concerning for those employed at the part-time/auxiliary level. As the proposal stands, it would require non-full-time officers to spend as much time in training as their full-time peers. In addition to losing perspective police over abundant training requirements, Bellville faces officers jumping to nearby departments who can offer them more money. Bellville Police Chief Ron Willey says on average, neighboring police departments pay patrolmen $3 to $5 more an hour than Bellville. Councilperson and head of the Safety Committee Bruce Snyder stated at the June 2 council meeting that the police departments will more than likely lose Officer Joshua Frech to Mansfield City Police. The reported move is over his compensation and benefits. Frech has served the community since 2011 and is currently one of four full-time officers. He is also one of five who have left the force since 2013, three of which were over compensation concerns. With limited personnel, Willey said the department is not able to cover all needed surveillance operations. As for Ohio’s training increase requirements, the proposal is far from concrete but Snyder expressed that a decision from the state could come down within a few months. Jones is the editor of the Bellville Star. You can reach him at (419) 886-2291, email him at zjones@civitasmedia.com and connect with him on Twitter at @Bellville_Jones.